Ai WeiWei. Andy Goldsworthy. Vik Muniz— here’s a Vancouver welcome to some of the world’s most celebrated artists. The Vancouver Biennale is back with another two-year exhibit of public sculpture and art by these and other artists from around the world. This is the Biennale’s third series, and this time it covers the region, from Vancouver to Squamish, North Vancouver to New Westminster, complementing our spectacular scenery from river to sea to mountains. At a local scale, one of last summer’s most pleasant moments was finding a gaily painted, full-size upright piano on the seawall at False Creek, commandeered by a group of musicians just looking to make a joyful noise. They quickly attracted passers-by, as did other pianos located on Robson St. and other public spaces around the city. “Keys to the Streets,” a project of CityStudio Vancouver, a vibrant innovation and education hub, is back this year with ten pianos, including one at Lot 19, the park at Hornby and Hastings Street where this week’s City Conversations will take place. On a more ambitious scale, the Vancouver Biennale is back with another two-year exhibit of public sculpture by artists from around the world. 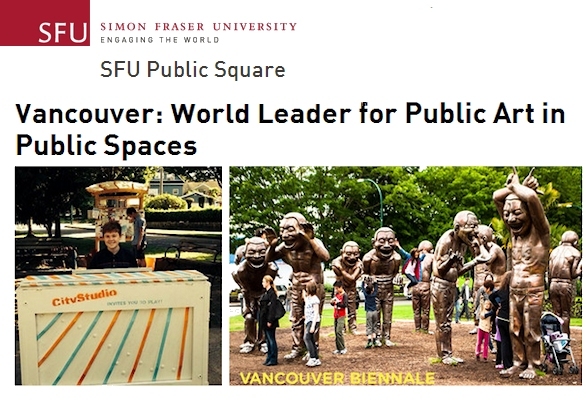 Vancouver may not have the biggest museums or concert halls, and public pianos began in another city, but our rotating and permanent public art displays in public spaces rivals those of many cities ten times its size. Vancouver may not have the biggest museums or concert halls, and public pianos began in another city, but our rotating and permanent pubic art displays in public spaces rivals those of many cities ten times its size. Instead of being tucked into temples of culture, our art is in outdoor public spaces, free and accessible to all. How did Vancouver come to hit so far above its weight? How can it sustain this momentum. and grow? Barrie Mowatt, the Biennale’s founder and president, and Lena Soots, Program Manager of CityStudio, will share how they’ve done it. We’ve also invited a representative from the Vancouver Biennale. Join us for a sunny summer conversation on art, and enjoy some music, at Lot 19. Rain or shine! Check out SFU City Conversations!